Durable Connectors -- No damage or weakening after 5,000+ times bent in the swing test, the cable that will live along with your phone. Braided Construction -- Skinned by high-density nylon braided, 21AWG power and 30AWG data tinned copper wire cores, more durable than normal TPE jacket. Unmatched Fast Charging & Data Transfer -- Supports 5V/9V/12V fast charging at up 2.4A current, compatible with QC2.0, QC3.0, MTK PE Plus. Data transfer speeds of up to 480MBps also support charging during data transfer. 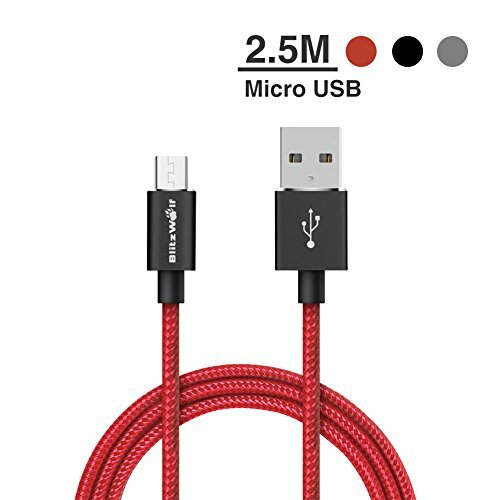 High Compatibility -- Compatible with most of the micro USB digital devices like android smartphones, tablets, MP3 players, PDAs, digital cameras, camcorders, hard drives, e-readers, power banks, portable game players etc.